Music is a staple accessory in many homes. In fact, a room’s elegance and ambiance can be further exuded by selecting a musical accompaniment to flow through out the space. These two new options by german designer Sonoro Audio can provide the tunes without looking like an eyesore on your entertainment center, wall or cabinet. The elements W Internet/FM radio and the eklipse, both all-in-one compact audio systems each com with Apple iPod docking capabilities. These major design and consumer electronic award winners are distinctive for their striking minimalist appearance and exceptional sound quality. Both audio systems feature handcrafted curved-corner all-wood casing in high-gloss black and white lacquered finishes and are distinguished by a brushed metal navigation ring with an alluring golden glow and the industry’s highest standard OLED display. The elements W’s impressive features include Internet / FM radio for listeners desiring immediate access to music from around the globe, and media streaming from partners such as Pandora. 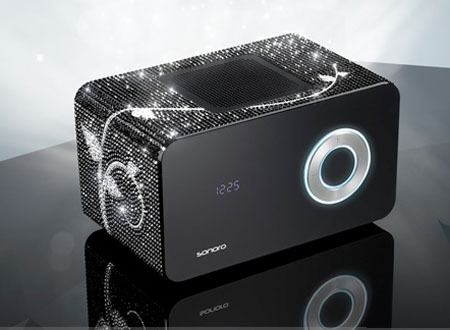 This futuristic radio connects music lovers to more than 16,000 worldwide Internet stations via Wi-Fi or a standard LAN cable and updates stations everyday with new and exciting selections. Users can find their favorite tunes by genre or geography. Audiophiles can discover new artists in different countries and create their ideal mix of cultural, urban, classic or popular songs. They can select music by an intersection of style and location, such as New Orleans jazz, New York hip-hop or London electronica. elements W can also access and play music libraries directly from a computer, such as those loaded into iTunes. With the purchase of the matching sonoro eDock, it can also play and recharge an iPod. The eklipse is an AM / FM radio and alarm clock that also plays CD / MP3 devices and is complete with an integrated iPod charging dock for quick home access to playlists. As an all-inclusive desktop device, it is on par with more costly home stereo systems for sound quality, yet rivals them in design. The elements W and eklipse come with a matching radio frequency (RF) remote enabling listeners to navigate their iPod playlists and to switch between CD, AM / FM and AUX, a feature that enables MP3 players, computers, mobile phones and the like to be connected by a 3.5 mm cable, which sonoro includes with each product. Both design products are available through select high end department stores, specialty lifestyle and A/V shops and online. Each has a recommended retail price of $499.00 and $79.00 for the elements W eDock. 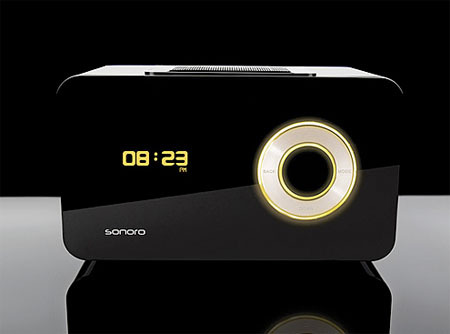 To learn more, visit www.sonoro-audio.com. I have been wanting to buy a something that could play Pandora, thanks! These are really sleek looking and would really fit in to any modern designed home. Our homes are aesthetically pleasing when it comes to how they look, how they feel, often even how they smell. Finally, someone has realized how important it is that they sound great, too!